What happens when Sue Halpern and her under-occupied labradoodle Pransky become certified as a therapy dog team? Find out at this event! 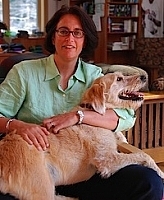 At loose ends with her daughter leaving home and her husband on the road, Sue Halpern decided to give herself and Pransky, her Labradoodle, a new leash—er, lease—on life by getting the two of them certified as a therapy dog team. Her new book is the story of that adventure. Sue Halpern is the author of five other books including Four Wings and a Prayer and Can’t Remember What I Forgot. THIS EVENT WILL BE A BENEFIT FOR NORTH COUNTRY ANIMAL LEAGUE Bear Pond will be donating 20% of our profit on books sold tonight to NCAL www.ncal.com There is no charge for this event but donations to NCAL are appreciated. Sue Halpern's book Summer Hours at the Robbers Library was available from LibraryThing Early Reviewers. Sue Halpern's book A Dog Walks Into a Nursing Home was available from LibraryThing Early Reviewers. Sue Halpern is currently considered a "single author." If one or more works are by a distinct, homonymous authors, go ahead and split the author. Sue Halpern is composed of 2 names. You can examine and separate out names.